On Memorial Day weekend, this post is more important than ever! Definitely want to acknowledge and give respect to the service men and women that gave their lives in order to help preserve our freedom, as well as those families that were left with a huge void that they had to learn to live with for the rest of their lives. It is our responsibility as a nation and citizens to make it worth it, as Captain Miller told Private Ryan. One way we do this is surround ourselves with friends and family during the holiday in order to remind us of what is at stake. But before you go inviting everyone over for a barbeque, you betta’ check yo’ self! Depending on who you are talking to, you could be giving people a false impression of what exactly is on the menu. Is it burgers, dogs, (God forbid!) veggie burgers or steak? Or is it ribs, brisket, pulled pork, or chicken? Are you grilling or barbequing? Does it even make a difference? Hell yeah! Different equipment, tastes, atmosphere, cook times, condiments, sides and, ultimately, guest reactions. So before you start throwing that “B” word around to your family and neighbors, you need to educated like you’re going back for your GED and listen up. For a you and me, students of the Art, there is a difference between barbequing and grilling. Barbequing is cooking “low and slow” using indirect heat to roll over our meat in order to cook it for longer periods of time and at lower temperatures (215-250 degrees). We use a piece of equipment called a smoker, which has firebox, where the fuel goes, that is either offset from the smoke chamber where the meat is or has a shield to block the radiation from the fire. Wood is the fuel of choice, in order to produce the smoke that caresses and gets absorbed into the meat, giving it flavor, helping it retain moisture, and forming the very distictive “smoke ring” just below the surface and is seen and admired when sliced. Although the type of meat does not define the method of cooking, traditionally, barbequing has been used to make tougher and cheaper pieces of meat more appealing and, well, edible. In a barbeque joint, you will see pork shoulder, brisket, and ribs on the menu; meat that generally needs a little more tender loving care. In order to respect the short attention span of my readers, I will forego an explanation in this post about why low and slow is used for these more collagen-rich slabs of nectar, and instead devote another entire post to the science of breaking down the components of the meat to make it oh so sweet. And now on to (sigh) grilling. Not that grilling does not have its place, but if you have the time, why would you bother. But if you have ever tried to smoke a hamburger, then you know why. 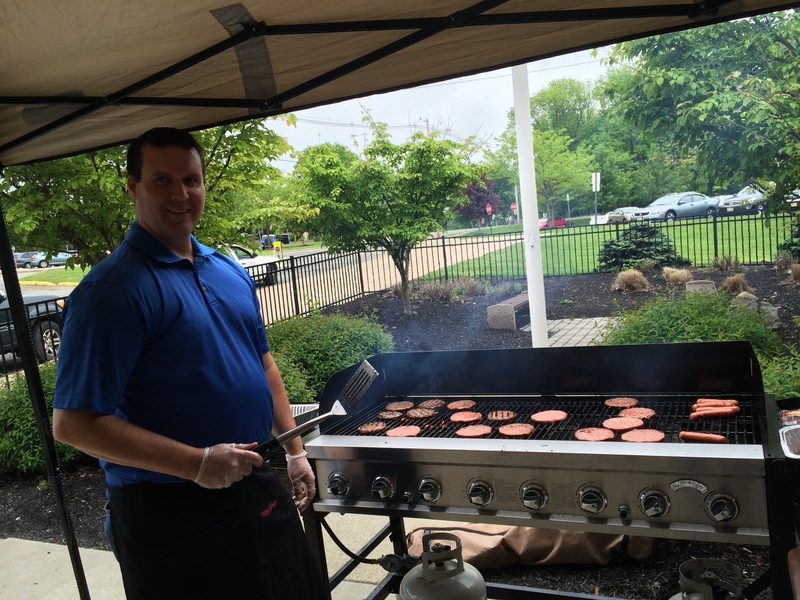 Hamburger, hotdogs, and steaks are the iconic American food and have their place at every (almost said “barbeque”) outdoor cooking event where grilling is the method of choice. Grilling is cooking over direct, high heat (350-400 degrees) and usually utilizes propane or charcoal. (Grilling diehards just cringed at me suggesting the use of propane.) The radiation from the fire or conduction of the grill helps sear and cook the meat. The advantage of this is that the grill is easier to light and keep at a constant temperature, the meat cooks a lot faster, and it is easier to retain the moisture of the meat. Grilling itself is an art, but one that will not be discussed much in this forum. Huge thanks and shout out to Huff Hearted for the question in BBQ Bits. Keep the comments and questions coming, and if you like the site, tell your friends. 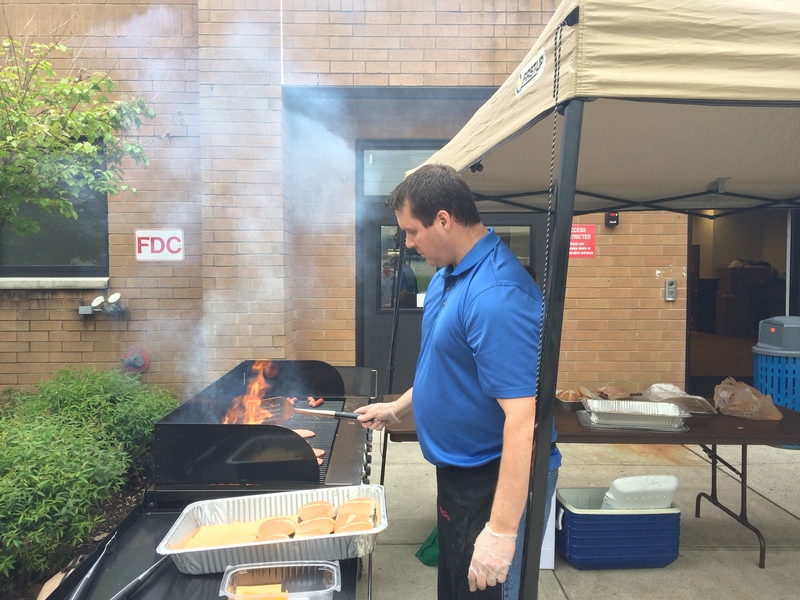 The writer grills up some burgers and dogs at Randolph High School. Go Rams!